Stephen Kitras' vibrant, handmade, recycled glass globes celebrate your bonds with family and friends. 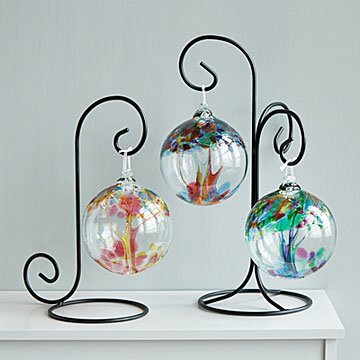 Celebrate those dearest to you with these elegant 100% recycled glass globes, handmade in Canada by Stephen Kitras and featuring an interior glass trunk that branches out to support vibrant splashes of color. Each globe is made from shards of glass used for car, home, and office windows. The shards are melted down in a furnace before being blown into beautiful works of art that have come to symbolize family, friendship, and the bonds that bring you together. Tree of Family: Like the roots of a tree, family gives us the support and love to keep growing no matter how far we branch out as individuals. Tree of Friendship: Like leaves on a tree, our life is brightened by friends who help define us as the individuals we are. The Tree of Friendship reminds us to cherish each of our friends, the old and the new, as each one adds a unique leaf to our tree of life. Tree of Sisters: Whether she's your sibling or your closest friend, she nurtures you, supports you, laughs, and grows with you. Tree of Motherhood: A celebration of mothers and the important role they play supporting us through the journey of life. Tree of Fatherhood: A celebration of fathers and the important role they play guiding us through the journey of life. Tree of Brothers: Whether he's your sibling or your wingman, he supports you, laughs, and grows with you. Sold individually. Not intended as a tree ornament. Use your own sturdy wire, fishing wire, or ribbon to hang the globe from the display stand or elsewhere. It's a beautiful piece of glass art with meanings within the colors. My friend loves the globe & plans to hang it near a window to really make the colors glow. Go buy one right now! Yes, you! Purchased the Tree of Motherhood. The pictures do not do it justice. It is absolutely stunning! I gave this globe to my high school girlfriend for her birthday. It is really beautiful and she loved it. She put it in her sun room to catch the light and said it looks beautiful. These are beautiful handcrafted pieces of art! This is great hanging from a window frame with fishing line. The light can shine on it beautifully!! These are beautiful and definitely bigger than they look in the photos which is great. The glass tree globes add so much to decorating my living room. Everyone that comes to my home comments how beautiful they are. Just a beautiful gift for any one. I bought three of these tree globes to give as parent gifts. I love that they are the same item but each is a bit different. They are absolutely beautiful. Each comes with a story card and information about the artist as well.